Wergeland group has for 60 years developed business in Sløvåg and Gulen Industrial Harbour to a complete, Gulen Industrial Harbor. Company located in the harbor have great opportunities to develop solid business in the oil and gas. Wergeland group assists companies establish new opportunities and infrastructure at the base area. Gulen Industrial Harbor is a Complete base in Sløvåg, Gulen. Wergeland Holding AS is the main owner of the Wergeland Group. Today the Group offers different services to customers within offshore, maritim and onshore industry and the private market. Quality, health, safety and environment are constantly in focus, and the Wergeland Group aims to be in constant development in line with our customers’ needs and governmental demands and regulations. Our employees are our finest resource. Together, the Wergeland Group and our employees are constantly working to develop and improve. Our aim is to be top class within our core businesses. The Wergeland Group’s main goal is to deliver complete solutions to suit each individual customer’s needs. Wergeland Holding AS, has been the founder and development of Gulen industrial Harbor as the land owner and Developer. The Family Company is solid and has build by taking out rock by rock. The Industrial harbor stands today as complete, with large vacant area for several types of industries. The area of quay hight ready areas is around 700 dekars, and its suitable for activity for use of our 10 quays. The establishment of base business has been gradual, and the base has large areal disposable for its activity. There is large room for other industries along with the establishments today. Emas spool base Gulen – Top modern spooling facility. Alexela AS – Oil Terminal. Wergeland Base – Base Services. Wergeland Halsvik – Environmental Company. Johny Birkeland Transport – Environmental Company. Vidsyn Commercial building and other smaller companies and entrepreneurs. The Wergeland Groups location in Finnmark is 40 minuts from Hammerfest, in Repparfjord, Kvalsund County. 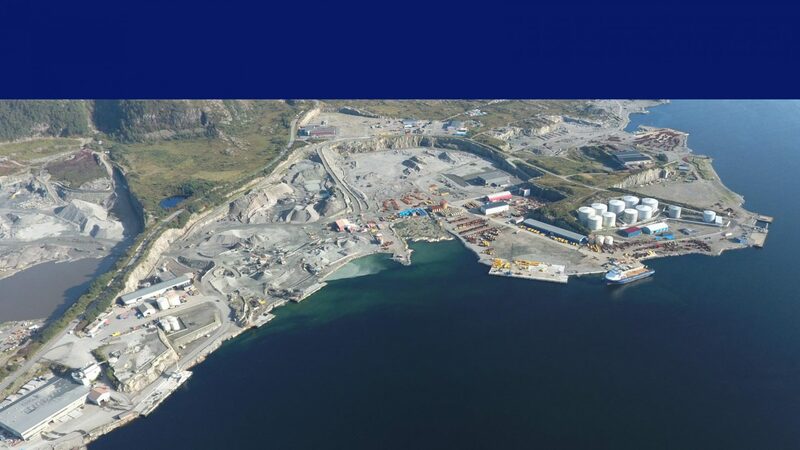 The industrial area in Repparfjord has a strategic location in relation to new oil-ans gas activities in the Barents Sea, and will have the possibility to be a larger harbor to handle this activity in the future. Offshore fill materials and gravel is the primary recourse from the quarry taking out industrial area today.